Scottish Adoption attended Glasgow Pride and took part in their first ever Pride March! Scottish Adoption were chosen as the Charity Partner for Glasgow Pride 2017 and with the theme for Pride being #ProudFamilies, was something that we were proud to be part of. 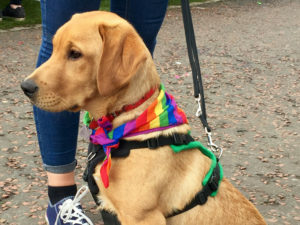 Taking part in our first ever Pride Event meant we were able to take part in our first ever Pride March which meant we could reach a much wider audience as we marched our way through the streets of Glasgow. The two day event started on the Saturday with the Pride March through the centre of Glasgow. The Scottish Adoption team, made up of adopted families and their children, staff and supporters, were part of a 7000 strong crowd who marched through the city. 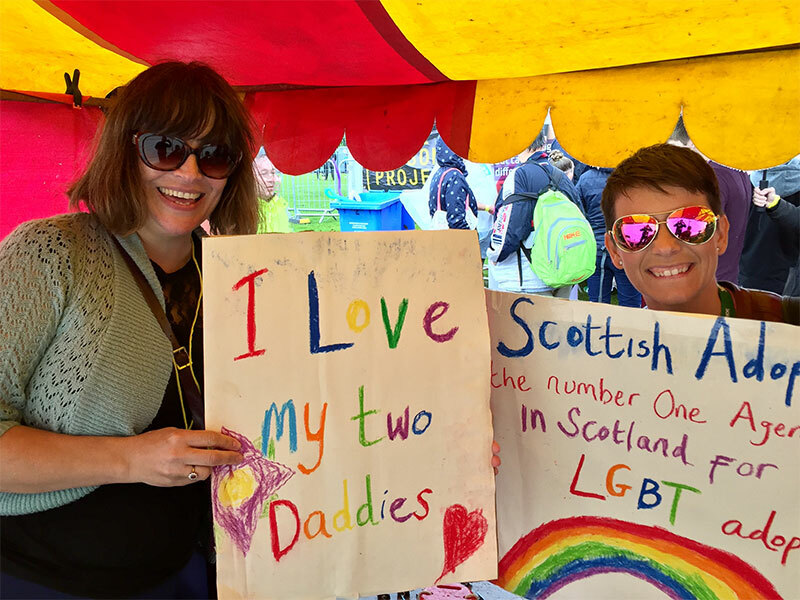 One gay dad who marched with Scottish Adoption commented about how humbled he felt with all the support Scottish Adoption were getting from the people who had lined the street. He added that he was welling up at moments during the parade because the support for being a gay adopter from the crowds was overwhelming. After the march Scottish Adoption had set up camp in the Expo area where lots of other organisations and charities had set up stalls. Everyone who came along to the Scottish Adoption stall heard all about the adoption process as well as hearing about the work the After Adoption team do, the support they give to adopters, children as well as other family members affected by adoption. Messages of suport come in from Ruth Davidson and Patrick Harvie wishing Scottish Adoption all the best on our first Pride March. Day two and Leasa and Dave were back for another day of sharing the world of Adoption with the LGBTQI Community. They were joined by a very special guest, the latest addition to the Scottish Adoption family, Reiver. Reiver attracted more people to the stall so it was another busy day sharing information, getting cuddles, belly rubs and licks.